What’s Left if a Natural Disaster Destroys a Community Association? We have seen horrific earthquake disasters in New Zealand and Japan. There have been devastating floods along the Mississippi River and unprecedented tornado damage in the Midwest. These disasters have wiped out large portions of entire towns, flattened numerous buildings, and resulted in widespread loss of life. California has a history of devastating earthquakes—the San Francisco, San Fernando, Northridge, and Loma Prieta earthquakes, among others. Heavy rains have created landslides, mudslides and shoreline erosion all over California, damaging homes and property, some of it in community associations. Wildfires in the past decade have destroyed hundreds of homes. Rising sea levels are threatening to flood low-lying developments, including common interest developments. What does a community association board of directors do if a natural disaster wipes out all or a portion of their association? When and where is it likely to happen? Is there a plan for dealing with it? Is this a problem to worry about? Yes, worry about it. A natural disaster can strike a development at any time. It can occur in a moment, or gradually over time. In either case, most community associations and special districts are ill prepared for the consequences. Disaster insurance is usually inadequate or non-existent and there is often little reserve funding that can be tapped to rebuild. What follows is a review of some of the types of disasters that can cause serious damage to a common interest development; how boards of directors should prepare their projects for the possibility of a disaster; and what can be done if a disaster destroys or does serious damage to a community association. We’ve written about various threats posed by landslides to community associations; the earthquake danger to certain types of multi-family construction; and the potential impact on homeowners from rising sea levels. In most cases, community associations do not have the resources to address damages caused by natural disasters. They do not have reserves for unexpected repairs and usually do not carry insurance for earthquakes, flooding due to levee breaks, beach erosion, or landslides. We look closer at the natural disasters prevalent in California—and the issues, financial, legal and otherwise--that follow them. Chapter 1 discusses the threat from rising sea levels and failing levees. Chapter 2 reviews the threats posed by landslides and some of the legal issues that arise. Chapter 3 looks at the serious threat of earthquakes, especially in California, and the special susceptibility of older community associations. Bethel Island lies in the Sacramento Delta between Sacramento and Stockton, California. Its home to about 2500 residents. The interior is 7-15 feet below sea level. There are 11.5 miles of levees that serve as a dam to keep the waters of the surrounding sloughs from inundating the island. Property taxes collected from the residents of the island fund a special district, the Bethel Island Municipal Improvement District (BIMID) which is responsible for the maintenance and repair of the levees and functions like a municipality or a large community association. More Bethel Islands? The Cargill Corporation is proposing to build 12,000 homes on reclaimed salt ponds in Redwood City. The homes will be surrounded by a levee. The new homes will be below sea level with only the levee keeping out San Francisco Bay. The source of funding for maintenance of the levee hasn’t been fully disclosed, but Cargill has already said it would not be Redwood City taxpayers, and it’s a sure bet that it won’t be the State of California. It’s very likely therefore that the proposed levee will be maintained by a special district like the one on Bethel Island, or a homeowners association, either of which, in turn, will be reliant on assessments or taxes from the homeowners within the development for its long-term funding. “Now, a plan to turn Treasure Island into an ecometropolis for 19,000 residents with slender high-rises, sprawling parks, a 20-acre organic farm and a wind farm is inching toward approval…But questions that poked holes in previous plans persist… there is the issue of paying for the infrastructure needed to stabilize the island, which was made with fill dredged from the bay for the 1939 Golden Gate International Exposition. The chance of flooding in cities in and around San Francisco Bay is not just speculation. It has happened many times in the past and it will happen again and again if sea levels continue to rise or a “perfect” storm joins with normal high tides. It’s easy to see why. Take a look at one of the several interactive devices used to illustrate the first areas around the bay that will flood when the sea rises. It should come as no surprise that they are the same locations where the bay was originally filled to create housing and commercial developments. These low-lying areas—Redwood Shores, Alameda, Vallejo, Alviso and many others—were bay bottom and tidelands just a few decades ago. Now there are thousands of homes. The flood danger is obvious. But what is different today from developments built, say, three or more decades ago is that most of these new developments will be built and incorporated as community associations and the expensive engineered facilities necessary to protect these developments from storms, rising tides and sea levels will not be owned by cities or the state, but instead will be the responsibility of the homeowners. Streets, storm sewers, parks, parking lots, and sidewalks in old developments are owned and maintained by cities and counties using tax dollars raised from a much broader tax base. In newer projects these “public” works are instead made the responsibility of private owner’s associations. The advent of the community association was a boon to tax-starved local governments who saw them as a way to promote development and raise new tax dollars while avoiding liability for these new facilities. The proposed new developments around San Francisco Bay will tempt local cities and counties to vest the responsibility for necessary flood control improvements to local community associations or small, special districts. Responsibility for levees, berms, pumps, riprap, and retaining walls built by the developers of these large projects could eventually find themselves maintained and repaired by homeowner associations. The beginning step of this massive shift of responsibility away from governments and onto landowners, one that has been widely used for many years, is the use of local improvement, levee, or the newer infrastructure financing districts. Much of the Sacramento delta, a system of sloughs and islands on which more and more housing is being proposed and built is maintained by such “special” assessment districts, not the state or local cities or counties. The property owners within those districts pay for all levee maintenance and repair work. Originally these districts were formed to give farmers quasi-governmental authority over the properties in a particular area. It also shifted fiscal responsibility away from larger jurisdictions and the broader base of taxpayers. But a flood disaster in an agricultural area will only inundate crops. The same disaster in a residential community will be much worse. It matters who is in charge and who is responsible for maintenance of such critical facilities. A large community association functions in a manner similar to a special district—ownership of public works is handed off by the developer to the association when development is complete, and the owners, through assessments, pay for the ongoing maintenance and repair. Cities and counties, which gain considerable tax benefits from new development, are able to shift the long-term responsibility for the cost of maintaining improvements associated with that development to property owners. This can be done with either a community association or a special district. By this mechanism, developers and municipalities avoid long-term responsibility for such projects. The homes and buildings within the development are sold off in the near term. The developer takes the profits and is protected from long-term liability not only by the assessment or taxing arrangement that shifts the cost of future repairs to owners, but also by various statutes of limitation that cut off legal liability in just a few years after the project is complete. After that, the property owners within the association, or within the special district, are on their own. So just as the liability for landscaping, streets, parks, even schools and unstable hillsides have been shifted to local homeowners in recent years, there is no reason why the flood control improvements necessary to build housing on former tidelands won’t be similarly vested in the buyers of all of this new housing. Their maintenance and repair obligations start immediately, and over time, the facilities may prove inadequate to forestall the inevitable rise in sea level, leaving homeowners on the hook for a lot more. There is another problem. We have written many times about the looming failure of community associations to keep pace with the growing cost of maintaining even simple common area components—but can you imagine what will happen if much more sophisticated, not to mention critical, improvements are maintained solely with owner assessments? Levees and seawalls, essential to keeping the waters of San Francisco Bay from flooding hundreds or perhaps thousands of homes, will be dependent upon the willingness of individual homeowners and their associations or districts to assess themselves to provide adequate funding? It’s one thing to let the landscaping go to seed or to allow chuckholes to exist in the parking lot, but a crumbling bay levee is at another threat level altogether. Of course, the proponents of new bayshore development contend that it will be good for the economy, for the tax base, and, ironically, for the environment, since it will shorten commute times for many bay area workers. But these benefits are all short term--if they exist at all. In fact the “benefits” are more likely to be realized only by the developers and the local taxing authority. There is lots of land available for necessary higher-density infill away from the shoreline on higher ground that would not be threatened by tides and sea level. It costs more to develop, perhaps and may not provide the economies of scale offered by salt ponds and tidelands, but its eventual owners would not inherit the potential for both fiscal and physical disaster. Anyone concerned with these new bay shore development proposals should ask the city one simple question: “Who will be responsible for keeping these flood control improvements working in the years to come?” Don’t be surprised by the answer. The litigation was hotly contested and the case only settled after a jury was empanelled to decide the case. A team of consultants and experts shepherded the Association through the Coastal Commission and construction process, allowing the seawall to be completed on time. The force of recent storm events underscores the significance of these efforts. A few years ago a Solano County community association had to sue its developer to recover the nearly six million dollars necessary to repair eleven separate landslides that threatened homes adjacent to common area hillsides as a result of heavy winter storms. They were lucky; the jury found in favor of the association even though some of the slides were dormant and had not yet caused damage. A round of new landslides in northern California has followed recent heavy rains and has damaged homes and infrastructure in numerous locations. As I write this, northern California is experiencing the second straight week of rain in an otherwise very wet year. Continuous rain soaks the ground and loosens unstable hillsides. Landslides can stay hidden for years until very wet weather suddenly breaks them loose. Also, slides can move very slowly, over long periods of time, gradually damaging the properties around them. In either case, earth movement can cause serious damage to buildings and other improvements on or adjacent to the unstable land. Mudslides, rockslides, and landslides are all versions of the same hillside phenomenon—water plus gravity equals damage. We’ve seen slides gradually pull down the surrounding properties so slowly that trees growing on the hill have curved trunks. This is called soil creep and can last for years or decades. We’ve also represented clients whose homes were damaged in just a moment as a large landslide, hidden beneath the surface of the earth for centuries, comes down, bringing a large portion of the hillside with it. Property developers are required to obtain the advice of soil engineers when grading is done in a landslide-prone area, and most engineers are very good at detecting the presence of hidden slides. Aerial photo mapping, boring, or just reviewing the history of the area under development can do this. But regardless of the engineer or developer’s efforts, slides can still occur. Very few property damage insurance policies cover damage due to earth movement and owners of buildings damaged by landslides are often on their own for the cost of repair. A major failure, such as we have seen on the California coast could easily overwhelm any community association. With landslides, unlike floods or earthquakes, the source of the problem may the responsibility of others. Here are some examples. Construction Defect. If a slide occurs in a development after construction is complete and the homes are sold, the developer is liable for any damage caused for at least ten years from the completion of the project. Slides, subsidence, settlement, and improper drainage are all considered construction defects. Arguments in those cases usually do not arise over who is liable—the developer and its contractors are usually “strictly” liable or negligent if a slide occurs on newly developed land. What the attorneys for each side usually debate is what is necessary to repair the damages and how much that will cost. Unless something suspends or “tolls” the statute of limitations, ten years is the usual outside limit for a claim against the builder of the homes and the subcontractors involved in the grading of the project. There are also shorter limitations on such claims, dating from when the event occurs that also come into play, so it is important to seek the advice of an attorney experienced in earth movement claims if a landslide damages your property. Nuisance. But there are other instances of damage caused by earth movement that are unaffected by the ten year statute of limitations. If a slide damages a neighbor’s property, the owner of the land where the slide originates can be liable to his neighbor for the damage; regardless of when the damaged property was built or sold, and regardless of whether any “negligence” is involved. The only limitation on claims of that sort date from the occurrence of the event. Unlike claims against a developer for new construction, there are no outside limits, but there are shorter periods dating from when the damage occurred that must be observed. Again, the advice of an attorney should be obtained to be sure that you don’t lose your right to make a claim against those responsible. A claim against the owner of property where the landslide originates can be for money damages, and also for injunctive relief—an order of the court requiring the neighbor to stop, or abate, the continuing damage being caused by the slide. These are usually claims for what lawyers call Nuisance—the invasion of your property by something that started on your neighbor’s land. Land, mud, and rockslides are events that don’t occur regularly, but when long periods of drenching rain soak hillsides that are unstable—either naturally, or because they have not been graded properly--slides can cause tremendous damage. When community associations own large expanses of hillside common area adjacent to buildings or homes they are prone to liability if the hillside fails. Without insurance, and lacking reserves for unforeseen events, they are especially vulnerable if they have failed to investigate and prepare. A recent article in the Los Angeles Times highlights an old problem that may have new consequences. The Northridge earthquake occurred 15 years ago and many southern California apartments suffered extensive damage as a result. One complex in particular however, was deadly. The Northridge Meadows apartment complex collapsed on January 17, 1994 and killed 16 residents. The collapse was due to a weak first story. Since the Sylmar earthquake in 1971, experts have known about the problem where parking or big windows exist under the upper floors of a building, and there were efforts in many cities to beef up building codes to prevent building collapse in a seismic event. The article points out that many landlords took steps to perform interim structural repairs, but that in many cases those repairs were not permanent or were not done at all. The small posts, for example that support upper floors over carports cannot withstand the movement that occurs in an earthquake. Government agencies have not exactly been on a fast track to force repairs. Fremont is reported to have sent out notices to the owners of 28 apartment buildings in 2007, the year its enhanced codes went into effect, but only two have completed the necessary retrofit. In Berkeley where 320 buildings have been identified with soft first stories, only half have applied for correction permits. We have a special concern for the numerous condominium complexes that have been converted from older apartment buildings. We have seen many that were built before 1994 and some which appear to have soft first stories--mainly where parking exists under the second or more stories of the building. Our experience is that Boards of Directors of community associations responsible for these buildings barely have sufficient funding to do routine painting and roof repairs. The cost of a seismic retrofit is not only unbudgeted, but probably could not be funded short of a large special assessment which would have to be approved by the owners. An expense of that magnitude could be the difference between economic survival and obsolescence. Our recommendation is that any suspected “soft-story” condition be immediately inspected by a structural engineer. If the conversion has been recently done, the seller may be responsible for the costs of a retrofit if one is necessary. But in any case, the Board and the owners will need assurance that if the “big one” hits the Hayward or the San Andreas Fault, Bay Area communities will not suffer the same fate as they did in Northridge. What’s common to all of the foregoing examples? They all involve special districts or community associations that had to deal with the effects of natural disasters. They were and are completely reliant upon the individual homeowners for the necessary funding. Public agency funding was and is not available. They also involved disasters which, in most cases, insurance is either excluded (flood and landslide insurance) or extremely costly and with large deductibles that make its purchase a questionable investment (earthquake insurance.) They also involve communities for which reserve funding for natural disasters is non-existent. The lucky ones, those that discovered landslide, structural, flood, or erosion threats while there was still time left on the statute of limitations, were able to bring claims that produced enough cash to retrofit the buildings or fix the damage. Others like Bethel Island, or any development more than ten years old, have no such recourse. The board can retain experts to investigate the vulnerability of the project to potential natural disasters. Older buildings, hillside common areas, proximity to the bay or ocean, construction on engineered fill or bay mud can expose an association to serious damage from storms, rising sea levels, or earthquakes. For example, older construction should be analyzed for issues such as the soft story problem and similar construction-related failures. Appropriate experts, structural and civil engineers, contractors and architects can conduct the necessary inspections and provide the board of directors with reports outlining any concerns and proposals for repair. Because buildings are not single products but rather an assembly of individual parts and components designed and put together by different individuals and companies, when acts of nature intervene to test the resistance of buildings and their components to storms, floods and earthquakes it is never exactly clear how a particular building will perform. For these reasons, qualified experts are a necessary and valued part of the determination of a project’s vulnerability to natural disasters. Experts are professionals whose credentials qualify them to analyze the ability of a building or other infrastructure to perform under stress. The qualifications needed are determined by the nature of the threat and the component, but with community associations experts are predominantly architects and engineers. Architects are generalists, who by education and professional preparation are capable of designing almost any component of a building as well as the entire assembly of components. Civil engineers, on the other hand, can be generalists also and/or specialists in certain discrete parts of the project. Geotechnical engineers study soils and the cause and cure of landslides and in foundation design. Structural engineers investigate the ability of the building framework to resist earthquakes. Civil engineers also can investigate earthworks, like levees, and drainage improvements to determine their ability to withstand rising sea levels or floods. There can be overlap among these disciplines and between architects and engineers, so the board should discuss their exposure concerns with the proposed experts to be sure they have assembled the right team. Once employed experts can begin an investigation aimed at three things: (1) does the project have a particular vulnerability to natural disasters; (2) if so, how do we fix it; and (3) how much will it cost to retrofit? These are important issues that, once determined, can provide a board of directors with a road map to improving the chances of the community surviving a natural disaster. “If the governing documents require a board to obtain earthquake coverage but none can be obtained, a record of that fact should be maintained and communicated to the membership. The board should then seek an amendment to the governing documents to eliminate the provision requiring the board to obtain the coverage. California law permits the board to petition the Superior Court to clarify the Association’s responsibilities relative to coverage where the members refuse to approve or finance its cost. “The floor layouts that make many condominiums and townhouses economical to build and maintain also make them vulnerable to earthquake damage. A typical condominium unit has many openings in the front and rear walls: either garage doors, entries, windows, or sliding patio doors. Since there is typically another unit next door, the side walls cannot have any openings. Large openings (or several smaller openings) in walls reduce the ability of the wall to resist earthquakes forces. Retrofitting an individual unit with extensive openings in the front and rear walls can be accomplished by installing a steel “moment-frame” in each of those walls. However, such moment-frames are costly to fabricate and install. Fortunately, the same traits that make condos economical to build in the first place could (with some creative legal and engineering solutions) also make them more economical to retrofit. The above solution would work easily for an apartment building, where the manager could simply say, ‘Your unit is the one with slightly less storage because of the seismic retrofit frame.’ With condos, all sorts of issues could arise—for instance, is an easement required for structural elements that clearly cross property lines? If the moment-frame that strengthens an entire building is within an individual unit, would the association have right-of-entry to perform inspections? Do the owners of the unit with the frame pay less in assessments because they are giving up space? Are they compensated because there will be more disturbance to their unit during construction? Known landslide hazards should be mitigated and suspected areas of potential earth movement investigated. Drainage and seawalls near the bay and ocean should be inspected and upgraded as necessary to remove erosion and flood risks. Structural components such as balconies, stairways, and catwalks that have deteriorated or have sustained wood rot should be braced or rebuilt. Common areas may need retaining walls or new drainage systems to cope with rising sea levels. We realize that it is easy to say “retrofit” but in most cases the expense of doing that will be beyond the capability of an association to fund, even though earthquake retrofitting, for example, may be cheaper in the long run than purchasing earthquake insurance, at least according to one source. Nevertheless, if an expert investigation identifies a serious vulnerability in the project, the board should investigate the possibility of a special assessment or bank loan to address it. If the project is not yet ten years old or is a conversion, a claim against the developer or converter may still be available. The association’s legal counsel can explore that possibility on behalf of the association. The board should notify the members of the Association’s disaster preparedness. Once the board has investigated the vulnerability of the project, reviewed and chosen the necessary insurance, and determined whether a repair or retrofit to vulnerable building components is in order, it should advise the members so that they understand the decisions that have been made. What’s Left after Disaster Strikes? 1. Assess the members? Fine for minor damage, but the cost of repairs for major destruction damages is often beyond the statutory authority of the board to assess. The California Civil Code limits boards to special assessments up to 5% of the prior year’s budget without a vote of the members. And will members likely approve an assessment sufficient to rebuild substantial portions of the project? That depends upon the value of the potentially rebuilt project compared to the cost of reconstruction. It also depends upon the political will of the members since most community associations must seek member approval for any substantial assessment. As the case of Bethel Island illustrates, even where a real threat to survival exists, the members--perhaps having lost faith in the board or simply because new taxes are unpopular--voted “no,” refusing to fund critical repairs to the levee system. Also, in bad economic times like we are presently experiencing, the value of homes may be less than the mortgage, giving owners little incentive to pay additional assessments and collecting from owners who are “underwater” can be a dead end. 2. Take out a bank loan? Many banks are generally willing to lend Associations the funds to perform their repair obligations. These loans are secured by the Association's authority to collect assessments. As a practical matter, any loan will require membership approval, at least for the special assessment to repay the loan and, in some cases, for the specific loan itself depending on the bank or the Association's governing documents. But, if equity is low or repair costs high, the bank may require that the members pay a certain portion of the repair cost "from their own pockets" before the loan will be funded. All this is problematic if owners are considering walking away from the development based on the repair costs or the magnitude of the damage. Bank loans, while possibly forming an important resource for financing post-disaster repairs, may not be adequate to raise needed cash and won't be easy to get. Also, since an association has only the right to collect assessments and has no real estate of value that could secure a loan, the bank may want to look to the members individually as the only real security—facts that may make member approval of a loan no slam dunk. 3. Declare bankruptcy? Why not just allow the association to declare bankruptcy and walk away from any obligation to repair or rebuild? Bankruptcies don’t typically occur with community associations for a big legal reason―the owners are essentially liable for the association’s debts. If an association assesses the members and someone doesn’t pay, the association has the authority to place a lien upon the individual’s property and enforce that lien for payment through the process of foreclosure and/or to sue the owner personally to collect the funds owed. For these reasons, a bankruptcy filing will not normally be considered a remedy available to a community association in financial distress. So the association is probably its own largest creditor given its legal obligation to maintain and repair the property. A project devastated by a natural disaster has little left to offer other creditors except, perhaps the value of the land. A Trustee in bankruptcy would succeed to the rights of the association and would have the authority to assess the individual owners which, in turn would likely hit the same wall discussed above—owners may just abandon their property rather than pay the cost of a major reconstruction. 5. Sell the project? Yes, it is possible and in the end, that may be the only viable option. Community associations are not single parcels of land. They are comprised of multiple parcels with separate owners. In a condominium, the association owns nothing. In a planned development, the most the association owns is the common area which has no inherent value without the lots. As owners walk away from property and mortgage holders start to take back whatever is left, the banks, and not the defaulting owners, could potentially become responsible for the next round of assessments to pay the cost of reconstruction—which in turn may discourage lenders from foreclosing. This could create a “whirlpool” effect that prompts owners and lenders to abandon ship so as not to be the last responsible party standing. If this happens, the property may just sit until someone with enough capital can martial the remaining assets, and aggregate the disparate ownership interests by whatever means are available. A developer or investor could theoretically acquire all of the separate titles directly from the individual owners and rebuild the project—a difficult task however, especially if some of the owners decided not to sell or could not be located. Creation of a single, salable parcel from those multiple separate interests is also possible with a member vote. If authorized by the members, the board of directors or a trustee could sell the project as a single parcel with the assistance of a court. When damage is severe and if the members vote not to rebuild, the California Civil Code allows the entire project to be “partitioned” which means aggregating all of the individual titles and selling the entire project. However, it is also not hard to imagine a disaster scenario where the buildings are so badly damaged that the owners have moved away and cannot be found. There is no statutory provision that governs those cases when a member vote is impossible to arrange. There are tools available to address a major catastrophe. These include pursuing timely claims against responsible parties like a developer or a converter; making insurance claims; obtaining bank loans; the imposition of special assessments; or selling the entire project. In theory, one of these tools might save a project, but actually implementing any of these can be a daunting task, especially for owners with limited personal interests or assets. Depending upon how records are kept; the nature of the catastrophe; how many units, owners or buildings are affected; and other factors, including communicating with fellow members, let alone being able to schedule post-disaster meetings or votes—employing these tools may prove to be a difficult challenge. And on a personal level, even if a vote could be taken and the necessary quorum achieved, the inherent "glue" that keeps members together may be lost in the disaster—some won't want to pay to rebuild and those who do won't be able to do so alone. The exceptions to this scenario include those developments that were built within the applicable statute of limitations—assuming the damage was the result of a failure by the developer to adequately anticipate the disaster in the design and execution of the development. The other exceptions are projects where the damage is not serious, there is adequate insurance, or the property itself is so inherently valuable that a sale would produce proceeds well in excess of the amount of the total indebtedness against the property. The massive loss of equity that owners in common interest developments have suffered in the recent recession coupled with the likelihood that most projects are underinsured and have no reserves to address serious disasters, leaves open the very real possibility that most boards would likely throw in the towel and let the lenders take over rather than try to rebuild. Just untangling the financial interests of the owners, the association, the lenders and the insurance carriers almost guarantees that a heavily damaged project will not leave much owner equity behind. So except in those cases where the land has great inherent value, more than likely the lenders, and not the homeowners, would end up with whatever cash is derived from a sale of the project and any insurance proceeds. If that were the case, the owners would have little incentive to do anything but walk away. Witnessing the Japanese and New Zealand earthquakes and the resulting tsunami; the floods and tornadoes in the Midwest; the recent spate of damaging landslides in California; the wildfires over the past decade; and the threats posed by rising sea levels all raise serious concerns about how a community association in the path of any of those threats would survive. We have warned before that community associations have a finite “service life.”  Given what we know, a natural disaster could advance that inevitable deadline substantially. “Special Districts” are government subdivisions created for the purpose of governing or funding a specific property or properties. They include levee improvement districts, municipal water districts, reclamation districts, and similar entities. Only landowners within the special district fund them and in that way they are similar to large community associations. BIMID was chartered in 1963 by an act of the California Legislature. Gokhman, Roman, “Bethel Island leaders worry about condition of levee as money runs dry” Contra Costa Times, April 2, 2011. Elinson, Z., “San Francisco Re-Imagines Treasure Island” Bay Guardian, April 24, 2011. Editor’s note: an “infrastructure taxing district” is a special district that relies on taxes paid only by the residents within that district—there would be no help from the City of San Francisco or the State of California. Page 1, San Jose Mercury News, June 13, 2010. Website for the City of Benicia, California. Ritter and Handley, “Report sees sharper sea rise from Arctic melt” Contra Costa Times, May 3, 2011. San Jose Mercury News, Ibid. California Government Code Section 53395, et seq. A special district would usually be the choice if the facilities to be maintained include multiple new developments or community associations. In this case the district is called a “GHAD” or Geologic Hazard Abatement District and provides a vehicle for developers and cities to dispose of responsibility for unstable, and thus unusable, pieces of land left over from larger developments. Berding, “The Soft Story Problem and Earthquake Safety,” Ibid. 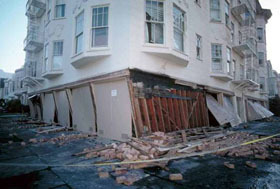 Association of Bay Area Governments (ABAG,) “Expected Housing Losses in a Major Earthquake” 2002. My thanks to Fred Pilot and Evan McKenzie for providing me with this article. California Civil Code Section 1366(a). Berding, No Right to Refuse Payment, 2008. The standard clause included by BerdingWeil in the CCRs that its attorneys prepare provides for alternate repair strategies to be presented to the members. But if none of the alternatives are accepted, the board of directors is given the authority to sell the property without a further vote.